This week’s Collector’s Gem is the 59-Patton. This Tier 8 Chinese medium tank is the result of combining features from two familiar models: the Chinese Type 59’s chassis, and the American M48 Patton’s turret. The 59-Patton boasts excellent gun depression and good accuracy on the move, and marries the Type 59’s mobility with the performance of the M48 Patton’s turret. This vehicle will be available in the Premium Shop from 29th September 2015 to 01st October 2015 in a special weekly bundle, which includes 4,500, a free garage slot, 30 days’ Premium, and the vehicle itself. We’re also holding a contest for all early bird adopters of the 59-Patton. Check out the details here! Tank collectors, take this opportunity to complement your arsenal with this unique vehicle. With its blend of mobility and accuracy, and its 9-degree angle of gun depression, you can wreck your opponents from unexpected angles! Take caution when fighting against Tier X vehicles, however. The 59-Patton tends to have difficulty penetrating heavy armour, and its sloped armour may not be sufficient against some rounds used by Tier X tanks. The commander’s cupola is also one of the tank’s weak spots, so users will need to take care to position the 59-Patton in an advantageous position, where the weak spot is less exposed. Gun depression is an outlier with a whopping -9 degrees, surpassing the Type 59! Are you an expert tank commander, who can exploit strengths and mitigate weaknesses? Show us! 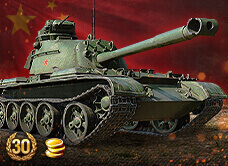 Acquire any Mastery Badge using the 59-Patton during the event period. For those using other download pages and those whose WoTReplays.com replay page look like this (missing Detailed Report tab), include a screenshot of the Personal Score tabs of the Battle Results in your submission. Deadline of entry submission is on 01 October 2015 at 15:00 (UTC+8). Prizes will vary depending on the Mastery Badges acquired during the event. Prize will go to the Ace Tanker submission with the highest base EXP earned. This thread will open for submissions on 29 September 2015 at 14:00 (UTC+8).